DARTMOUTH – Fledgling piping plovers blending into the pebbles on Horseneck Beach are part of a success story. Working with the federally endangered species, Lloyd Center Jamie Bogart has spent his summer making sure beachgoers stay away from the baby plovers before they fly south. Fencing and posting signs was the key to keeping people away form the presence of the nesting plovers. Mr. Bogart set up wire and wood fencing around a refuge area covering about 400 square meters of the eastern half of the beach near the camp grounds. Fencing in a piece of beach visited by hundreds of beach goers every day is not an easy task, said Mr. Bogart. Plovers were originally hunted for their feathers and became an endangered species in 1986 after succumbing to the human pressures such as beach cottages being built on their nesting grounds. Like clockwork, the Plovers start flying back to the South Coast area around March 14, usually nesting on the sand close to the dunes, and laying their eggs in May or in early June. They want to nest close to the water to be near to the tidal food source, said Mr. Bogart. When nesting, they scrape with their feet a small indentation kicking up the sands behind them. They may make as many as 10 nesting places before they pick the one they are going to lay their eggs. Plovers lay about four eggs, which they incubate for about 28 days. When they hatch, “the hatchlings are running all over the place,” said Mr. Bogart. There were three breeding pairs located at Demarest Lloyd Park and Horseneck Beach this summer. In past years, Horseneck Beach has had nine or ten pairs, but many didn’t come back this year, he said. The Lloyd Center hires interns to help track the number or eggs. They use binoculars and field science notebooks to keep a count of the adults. The birds are not banded because that would injure them. Researchers have found that sometimes the plovers get upset with the research inters. “We try to minimize contact. If we go towards the hatching eggs, the birds imitate a broken wing, feigning an injury to get you away from the nest,” Mr. Bogart noted. It is remarkable this tiny bird has made any headway after facing man-made dangers, natural predators, and vandalism. 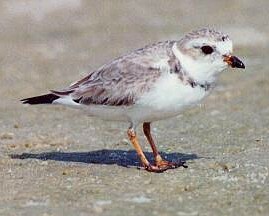 The first week is critical, for the plover population has a lot of enemies, including skunks and coyotes. Coyotes generally impact the birds the most. “Last year, the birds received a double whammy with the oil spill and natural predators. All the barrier beaches have pressures on them,” suggested Mr. Bogart. Mr. Bogart also takes care of Gooseberry, Demarest Lloyd and West Island nesting areas. “I am watching the whole county. The Audubon Society helps out at Allens Pond, and divides up the task,” he said. The oil spill put further stress on the nesting places for the plovers. It is widely known that Allens Pond was hit the hardest, said Mr. Bogart. The plovers weren’t killed because of the oil, but the Horseneck birds were impacted because the eggs they laid didn’t hatch because of the presence of the people during the cleanup. This year on Horseneck, only about half of the birds returned. “Was this due to the oil spill or all those people in yellow coats running around? This is speculation,” said Mr. Bogart. The Horseneck preservation project has suffered some vandalism to the fences. “We can’t see everything that goes on, and it happens sometimes because of people letting their dog run loose,” said Mr. Bogart. To let a dog run loose is against the law in any area that has nesting plovers and the owner has the liability. Fines can be imposed. “During the course of the season, people don’t realize that a loose or leashed dog is really a scary thing for the plover,” he said. One year at Horseneck, a pair of plovers chose a nesting site in one of the pavement cracks close to the parking area, providing what Mr. Bogart suggested was one of the amazing pairs in his career. Mobs of people had to be inconvenienced to protect the plovers, he noted. The birds eventually became accustomed to the people walking by, and they successfully hatched a handful of nestlings. Mr. Bogart was thrilled that three hatchlings were successfully born on Horseneck this summer. The hatchlings were late this year and may have come from a second nesting period. Truly a home on beach sand and along the water’s edge, the three young birds scurried along Horseneck Beach and quickly became almost invisible to the eye. For Mr. Bogart, it is a heart-warming sight.“This is a step in the right direction again. It seems to be if they raise their children here, they may come back,” he suggested.